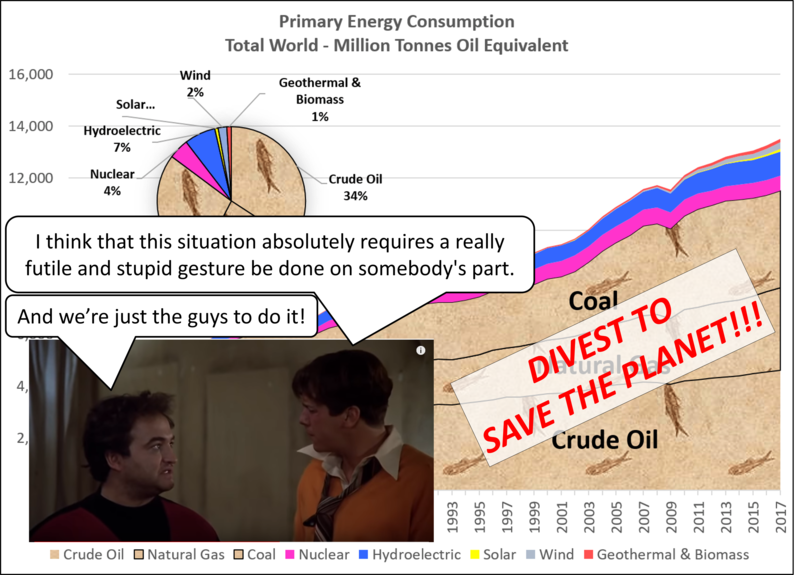 Fossil Fuel Divestment: “A really futile and stupid gesture” according to Yale-educated climate activists. | Watts Up With That? Yale’s Endowment Won’t Divest from Fossil Fuels. Here’s Why That’s Wrong. Two climate activists and Yale alumni confront the arguments of Yale’s chief investment officer, arguing that he must summon the moral clarity to end support for fossil fuel companies. At a lecture at Clare College, Cambridge, Swensen stated that modern society depends on fossil fuels, and “if we stopped producing fossil fuels today, we would all die … the real problem is the consumption of fossil fuels, and every one of us in the room is a consumer. And I guess it’s a little harder to look in the mirror and say I’m part of the problem.” Swensen’s statement is a gibe at unrealistic activists. He seems to be saying, climate change is a threat, but are you really not going to board your next flight to Miami? At its essence, divestment is a symbolic, culturally punitive act. Yale’s divestment would not subtract from the supply of fossil fuels available to burn. –Yale-educated climate activists Jennifer Stock and Geremy Schulick, 2019. Otter: Bluto’s right. Psychotic, but absolutely right. We gotta take these bastards. Now, we could fight ’em with conventional weapons. That could take years and cost millions of lives. Oh no. No, in this case, I think we have to go all out. I think that this situation absolutely requires a really futile and stupid gesture be done on somebody’s part. Bluto: And we’re just the guys to do it. ΔΤΧ Rush Chairman Eric “Otter” Stratton and future US Senator John “Bluto” Blutarski,, Faber College, 1962. Is it just me… Or does it strike you as odd that college graduates, 15 years after graduating, would even care how their alma mater was investing its money? Shouldn’t they have jobs by now? Clearly in 1977, Otter, Boon, Pinto, Flounder, Bluto and D-Day weren’t bugging Faber College about its endowment. I went to college in the same city as the Yale climate activists (different school), graduating in 1980. I haven’t even been back to my campus since 1988 or 1989 – and then it was just to visit my professors. At the time of my 15th reunion (assuming Southern Connecticut Class of 1980 even had a 15th reunion) in 1995, I was busy drilling wells, finding oil & gas, in the Gulf of Mexico. I’m still busy doing that today. I’m sure that Southern Connecticut is fully invested, at least philosophically, in Greentardia. Do I care? No. I don’t give a rat’s @$$. I have work to do. David Middleton is a 1980 graduate of Southern Connecticut State University (College back then). He has been a proud member of the Climate Wrecking Industry since 1981, a member of the Society of Exploration Geophysicists since 1981 and American Association of Petroleum Geologists since 2004. 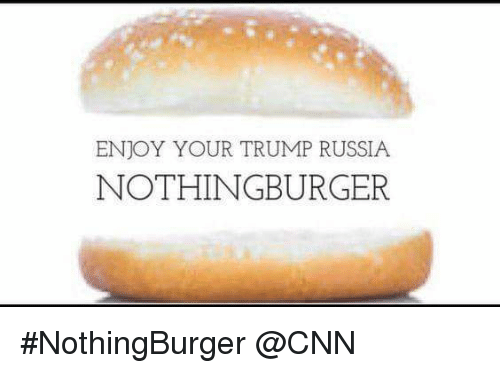 PS… How about that Trump-Russia Nothing Burger! MAGA!!! does not in any fashion depend upon fossil fuel companies stock valuation? Even if such an act could affect those stock values. Visited a campus lately ? I was thinking that listening to students declaring what pronouns they use on a recent college tour with one of my children. Then I realized that these students will graduate but also can drop out at their choosing. That’s not the case with prisoners. But one school seems to be run by student committees which is similar to your declaration. It’s called “virtue signalling”, kent! Liberals, Social Justice Warriors and other hypocrites are very hot on virtue signalling. It saves the trouble of having to put their money of their conscience or their lives where their mouths are. They may be “signalling”, but there is no “virtue” involved. Divestment is always futile because selling your holdings of certain stocks requires someone else to *buy* those same stocks. The economic impact on xyz company is absolutely 0; somebody else who shares the vision will invest that amount and likely will gain a profit doing so. I was about to post the same thought. Drive the price down, and my mutual fund will buy it at a lower price and I’ll profit in the long run. You have to be financially ignorant to think divestment ‘punitive.’ The corporations don’t care who owns their damn stock. But what is ‘culturally punative?’ Twerps sell the stock. No one knows. They announce they sold the stock. A culture is punished? What does it even mean? Higher education is a business. It wants and needs students so it pushes the increasing falsehood that You Need College/Uni. People go to College/University because the Colleges/Universities tell them they need to. The system will then happily feed on the bright eyed masses who are blissfully racking up massive debts in the name of their Hobby Degrees (Hobby Degree? Will it help you get a better job? No? Then it’s a hobby) and gleefully expand their product listings to include any rubbish their victims are willing to pay tuition fees to study regardless of the long term instructional merit. Higher Education is an industry that responds to the markets. If the market says ‘I want a degree in post neo cis sarcasm within the environment of blog trolling’ then Higher Education will end up offering it for their 2020 intake. Yes, you can come out the end ‘Educated’, but ‘Educated’ and ‘Intelligent’ are not always the same thing. Higher Education is possibly the second biggest con of the modern era. I believe you want to differentiate between schooling and education. One doesn’t need to go to school to get an education. Attending school to be schooled in how to think and act is hardly an education, and a poor substitute for learning to think. Our younger son didn’t even finish his first half term at college before he’d got bored and left to work and earn his living. He now age 22 has his own company which is doing well. He works long hours but isn’t having to pay off unnecessary debts run up learning stuff that isn’t relevant to what he does, if he needs to know something about some aspect of his work he finds pays for and takes specific training on it. I did an apprenticeship (many years ago now) and worked on what I was being taught about so saw the use of what I was learning. This modern love of turning everything into a University subject just means those with a natural ability to do these things end up giving up because they might not have an academic mind. In an afffluent society wherein even ordinary people can drive Mercedes, by sailboats, and vacation in Europe, a big differentiater of rank can be moral purity. We know the phenomenon of phony male progressives seeking dates with idealistic targets of affection, by posing as saviors of the earth and the downtrodden. As a callow youth I tried it. Believe me it works, though if you have any conscience at all (at twenty, I had a little) it leaves you feeling soiled. Another body of stupid ignorant virtue signallers is the Synod of the Church of England – all those bishops- who want fossil fuel companies to conform to the Paris Agreement. How? What ? I’ve had interchanges with the Bishop of Salisbury who leads and he believes that the IPCC’s SR 1.5 report is the way to go and it’s being taken seriously world-wide. Of course none of them have done any maths and can’t count for toffee. I’ll try and snap up the shares disinvested if the price is right. Part of the divestiture movement is so that when these neomarxists implement their energy destroying policies, they won’t have any skin in the game. If you know you are going to set the building on fire, doesn’t it make sense to get you and the things that you like out of it first? This. We know that the Climate Faithful aren’t pushing divestment because it would hurt the Fossil Fuel industrys, because it won’t. And the sure aren’t doing it because of the naked hypocrisy, they’ve never cared about that. Hell, they’ve written newspaper articles telling their followers not to worry about their hypocrisy because it doesn’t matter in the long run. No, the real reason is because they know a man is more likely to cast a vote or pass a law that destroys Millions of people’s fortunes if he knows his won’t be one of them. Skin in the game, in dead. What’s really shocking is the size of those endowments. Think about that the next time you see any of these universities raise tuition (usually faster than inflation). What a racket. I gave up donating to Yale years ago when they started all the Social Justice Warriors BS and Climate Change/Warming monkey motion. The really last straw was the Diversity VP at some outlandish salary. It their job isn’t to invest the $$ where they will give a good return than fine, get rid of those stocks. But to divest, to make some social statement as innocuous as climate change than they should just stop breathing if they are worried about CO2 being the problem. The biggest reason why divestment is stupid on steroids is that it would cost Yale’s endowment fund dearly, probably to the tune of several hundred $million. Yet these climate numpties don’t care about that. They are focused on the all-important virtue signaling. 13% return over 30 years? Leave that guy alone! Find some other way to engage in your virtue signaling. I recognize I didn’t include 13% EVERY YEAR over 30 years, he did really good! My bad, my wife was yelling at time that it’s time to go. Yes leave that guy alone! I was all set to say “fire the bum!” if all he got was 13% over the whole 30 years, but I checked the article and that’s per annum! I’ve got to look at their portfolio and copy that bad boy! D.J. and others, sorry, I was in a hurry as my wife was yelling at me, something about an Anniversary Dinner, and I rushed and didn’t get it straight. I thought about it on my way downstairs and came back up and added the EVERY YEAR part, which promoted more yelling! You would think after 20 years she would have me figured out? Can’t leave Watts UP hanging! Anniversaries come every year, Ron. But you’ve only got one brief moment to get your post just right. I swear! At some point my phone got an ‘update’ and now the stupid spellchecker that used to change words that were right into other words is now changing PARTS of words into other words. I mean, really. How do they constantly make these things worse? WHY do theyou? Why are they so stupid? Because their professors are equally stupid. He was a music major, she is a writer. I doubt either took anything remotely related to math or economics. From The American Prospect MAR. 08, 2019. Further article. About the Yale Student Activists and Divestment. By Amy White May 07, 2018. Quartz…somewhat lefty… also has a detailed article of this investment fund and how critical it is to Yale spending on all educational, research and scholarship matters. By Allison Schrager. October 3, 2018. Note that it is reported that Swensen got a $4.3 million salary for 2015. Worth every cent and would get triple, or more, in private enterprise with these results. Music is remotely related to math. The long game is divestment in capitalism. If we ended capitalism today, all socialists would die. Socialism can’t exist without the ability to leach off of capitalism. “my husband and I though, are climate activists” you’ve put your finger right on it. You are engaged in advocating for mindlessly harmful policies. Stop doing that and become a productive member of society. You will feel better about yourself. These damn fool “activists” crusading against the fossil fuel industries are actually retrograde religious fanatics promoting a Neo-Prohibitionist movement vastly more stupid and futile than the anti-Saloon League of the early 1900s. Alcohol can never really be “banned” because it’s a food, and it’s made from other foods. It’s too easy to make; only a tad more difficult than fermenting flour into bread. Alcohol has drug-like effects, but it’s NOT a drug like any other. The fossil fuel Prohibitionists are trying to repeal the domestication of fire. That’s the technological breakthrough that provides our most salient distinction from other animals. Some birds, chimps, beavers definitely, ants and a lot of critters use tools, and have language. NONE have domesticated fire. Using fire is the foundation of civilization — enabling us to make tools, which make houses & machines, harness animals, survive in variable climates, and on and on. Fire extends at least 80,000 years further into the past than beverage alcohol. It ISN’T going to be banned. Deranged, retrograde societies may wish themselves back into poverty by the attempt, but the most likely result is that they’ll get recolonized and absorbed by societies that aren’t afraid of fire. Sort of like societies that didn’t come up with the wheel on their own. Where are the wheelless people now? It’s their activist generation’s anti-war crusade. It’s probably the only thing that apparently gives them meaning to their otherwise very boring, very pampered, and wholly erudite lives. The difference between Jennifer’s & Geremy’s opinions and the opinion of chief investment officer, David Swensen, is that he has been asked (& paid) for his. I have known more nitwits who went to (and graduated from) Yale College than I can count. It may be the most overrated degree in the entire universe. First off, I’d guess that Yale Class of 2003-2004 had around 2,000 graduates get Bacelor’s degrees. So let’s be fair to the other 1,998 others many of who likely do not share Jenn and Gerry’s far-left activist views on wanting a the US to commit capitalist societal suicide. To be sure, Yale grads certainly tend to be more liberal. Of the US voting public about 35% are democrats’ and maybe half of those lean feminist-socialist-activists in their thinking. So let’s be charitable and say 60% of her class thinks generally along those lines – fossil fuel is bad, capitalism is evil, and so forth all in line with today’s Socialist-Democratic Party tropes. That still leaves around 800 or so Yale-ies from her class who probably understand Jenn’s and Gerry’s brains are full of schist. Of course she is a writer, which implies she got a BA from Yale. And Gerry, well he is “content curator” whatever that is? Maybe he’s the guy who works the online-article IT stuff at the uber-Liberal Project Drawdown. Is he the guy they call when they can’t get their Mac to display a Windows Power Point presentation (those damn windows meta pictures)? Sounds like a productive use of a 4 year Ivy League education that cost at least a quarter million dollars. We can only hope they have kept with their “Save the Planet” idiocy and haven’t reproduced. I just wonder if these two Yale geniuses have any idea what CO2 does in the environment, and it’s massive natural sinks and sources that dwarf mankind’s puny additions? At 410 ppm, we’re only about half way to where it needs to be. Isn’t that the ‘Top 100’ list that stops at 80? Not sure I would want that turkey on my CV to be honest. You are a little high on your estimate of the Yale class of 2004. According to a Website I found the class of 2004 graduated 1352. Sure. Go ahead and divest. I’ll buy the equities at discounted prices. Fun activity: Wander around on a college campus committing various “micro-aggressions”, like addressing a coed as “miss”. Better than cow tipping! I see live coverage on C-Span right now of the Senate debating the Green New Deal. Love this site, but please keep the Trump MAGA crap off this site. ETTD Association with Trump will discredit climate skepticism in time. Not everyone is as intolerant of others as you are Bruce. And the alternative to Trump was a multiple felon lying douchebag. Association with Trump will keep the Marxists from destroying this country, ‘cuz climate don’t care about the Left’s climate fantasies. Indeed. As bad as anyone might think Trump is, the alternative was infinitely worse. While I never got to University , leaving school at 14 in 1941, there was a war going, my daughter did, she was working at the time and managed to combine both. While I am not knocking her graduation, she is very bright and has a strong work ethic, I while able to pass all the exams during my working days, I am of the opinion that getting a degree is the result of just knowing the answers to the questions asked at the time. It does not mean that you truly know all of the answers about the particular subject, so you can have a degree and still be a idiot out in the real world. Also of course it depends on just what subject you choose, if its a “Soft” subject, say a study of Elizabethan music, then what are your prospects for a job in the real world. To sum up, having a degree is no guarantee that you will be a productive member of society, capable of making a logical decision about anything other than the subject that you got your degree in. Societies have always produced people who seem to think that their mission in life is to “Save the World”. Such persons can cause a lot of damage if they end up in positions of power. It does not really matter who owns fossil fuel company stock. If you really think that the burning of fossil fuels is bad than you should stop immediately the use of all goods and services that make use of fossil fuels. That includes the wearing of store bought clothes and the eating of store bought food. Do not walk on man made surfaces of go into man made building because the materials were originally transported to the job site by trucks that burn fossil fuels. It is the money spent by those that make use of goods and services that make use of fossil fuels that keeps the fossil fuel companies in business. In my neighborhood, everyone would starve to death if it were not for store bought food that has involved the use of fossil fuels. I think it would be really nice if I could sit down with Bill McKibben and his follows so that they could explain to me how fossil fuel company shares changing hands hurts the companies. Do they even realize that all they are doing is forcing those shares to change hands with their divestment campaign? Do they really understand exactly what it is they are doing? I’m not an investment expert, but I image that all Bill would have to do is look at the number of fossil fuel company shares outstanding (shares actually owned by the investment public) and see what is happening to that number over time (seeing it on a graph would be nice). Watching what happens to fossil fuel companies’ share prices over time might be interesting as well if Bill wants to see what kind of effect his divestment campaign is having on those companies. But then, share prices are affected by other market forces as well. The website linked above (and I’m willing to bet that Bill McKibben is behind it) claims that 1,033 institutions and 58,000 individuals have divested or will divest from fossil fuel companies. If one understands what I said in the paragraphs above, those numbers seem rather pointless. It’s about eco-religion and feeling all nice and warm and and fuzzy about yourself inside. Some percentage of those fossil fuel companies probably pay dividends which the divestors are depriving themselves of. And if the share prices continue to rise in the years ahead, they are kissing off capital gains as well. Caving in the activism without much thought has its price. Yep… If “1,033 institutions and 58,000 individuals have divested or will divest from fossil fuel companies,” it was only due to the fact that other institutions and individuals were willing to invest into fossil fuel companies. Keep the hydrocarbons, divest from the naive investors. The world is figuring out that wind and solar can’t do the job of providing the people with enough energy to sustain them at today’s standard of living. Even with all the time and money invested we aren’t even covering our electrical energy growth with renewables, much less displacing fossil fuels. Fossil fuels will only grow in value. The hubris and arrogance to think that the world wouldn’t eventually figure this out is monumental. Could someone explain the title to me? Watch the price of the fossil fuel shares. If they fall then maybe some people are unhappy, allowing of course for the up and down movement of shares world wide, but I bet that long term we will see a rise. Other than the tiny percent of the activist, most of us like the comfort of our fossil fuel driven World. If the price of fossil fuel shares fall, it won’t be by much. Those companies pay solid dividends, and other investors like myself will quickly add more of the shares to our portfolios. Most dividend-seeking investors own some Conoco (COP), Exxon-Mobil (XOM), BP, Phillips 66 (PSX), etc. We also have shares of Duke (DUK), American Electric & Power (AEP), Con Ed (ED), Southern (SO), and other powerco stocks. I hope, with all my heart, that these bright Elis have put all their investments into companies promising the future they want – solar and wind turbine power companies and manufacturers. They may never see a dime in dividends, but, hey, they are saving the planet. More power to them; I suspect they will need it. There is a concept called Fiduciary Responsibility which applies to money managers such as the guy responsible for the Yale Endowment funds. Managers who do NOT invest with the best financial interest of the fund may – and have been – held accountable in court. It sounds like this guy, if he consistently grows the fund at 13% a year doesn’t have much to worry about from that point of view – UNLESS HE DOES WHAT THE ACTIVISTS WANT! The board of governors will decide, not the alumni activists. Divest from stupid would be a better strategy. There are two problems in this story. The activists are virtue signaling in calling for the fund to divest its holding of oil stocks. The other issue is that too many funds were over-weighted in the oil sector. Content that there would always be political risk in the Middle East;. In 2008 when WTI soared to 147 the oil stock index (XLE) set a high at 72. Both crashed. Crude down to 26 and XLE down to only 45. Then on the next rally into 2014 crude got to 112 and the oil stocks soared to 88, higher than in 2008. Funds were looking at the ME and missing that the revolution that had brought natural gas down in price was about to change oil production. Previous “revolutions” in mineral extraction started big time at Bingham Canyon in 1910. Then something similar hit gold production in the early 1970s with Carlin Nevada. Crude prices could be in a long decline but too many funds are counting on Middle East troubles. These people probably think that “1,033 institutions and 58,000 individuals have divested or will divest from fossil fuel companies,” is actually meaningful. Typical of innumerate idiots, they appear to be impressed with supposedly big numbers. They are not big numbers in scale. Exxon alone has over 4.25 BILLION shares outstanding, down from around 6 BILLION about a dozen years ago, from buybacks. Those shares are owned by over 2,600 institutions, down from, well, about 2,600 institutions. That’s ExxonMobil alone, not including other “fossil fuel companies” like Chevron, Conoco Phillips, Royal Dutch Shell, and BP. Who knows who owns Brazil’s Petrobas, Rosneft, Lukoil and Gazprom in Russia, and about a dozen more in China and the ROW, but the Yalies and their “divest” idiots will have zero effect on any of them. These are not “fossil fuel” companies, they are energy companies, and the world’s need for more energy is not going to stop any time soon. Their shares are desirable to have. ExxonMobil is in nearly every Top 10 list of companies to own in your retirement portfolio. Buy it (regularly if you can), reinvest dividends, retire comfortably. That’s great advice for regular folks. Yalie writers and scientifically illiterate climate warriors, not so much. Apologies, for some reason the link is corrupt. Just search “Beyond the Fringe Aftermyth of War” for some very funny 1961 British Footlights humour. Isn’t it a remarkable coincidence that people always find the ‘moral action’ when it suits their political beliefs? …as well as your comments immediately before and after that one. Please drop me an email. My address is on my sealevel.info web site. Concise review, but you might want to wait until WTI is down to around 27. Industrial commodities suffer significant declines during lengthy post-bubble contractions. If you want to put fossil fuel companies out of business, it’s really very simple – stop buying their products. No company can survive that. So how many of these people continue to buy products from the companies they vilify? And how exactly do they justify that? Feeling guilty about using all that electricity generated by those dirty brown fossil fuel generators? Well fear not! For only an additional 1.5 cents/kwh, you can enjoy the benefits of RECs (Renewable Energy Certificates) purchased in addition to the kwh you already purchased from your provider! Just think of it, you have virtually transitioned from planet destroying emissions to the wonderful new clean world of renewables. You are now greener than Kermit! Now you can sleep in peace (or elseware). Lookup “Arcadia” for some real, put your money where your brain was, virtue signaling.